As the weather cools off and the aromas of fall surround us, the urge for a warm, comforting drink with all the coziest spices can be overwhelming. The two go hand in hand: cold weather and a hot drink in hand. It can be tempting to run over to our local coffee shop and order the latest pumpkin-chai-gingerbread-streusel latte on display. However, the fat, sugar, and preservative content don't have a track record of leaving our body's feeling good (not to mention the inevitable caffeine crash! ), and we’ll be missing out on some incredible health benefits that a homemade version has to offer. 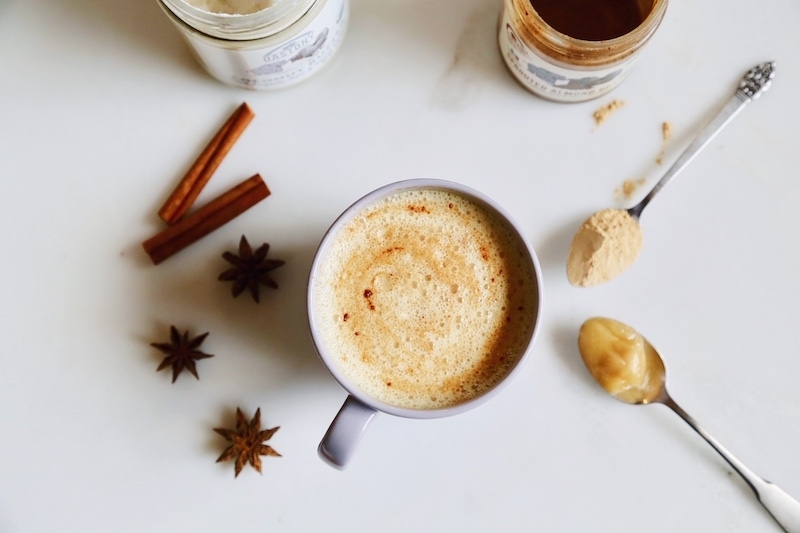 There is nothing quite like a homemade chai latte made from organic chai tea and spices. Combine it with creamy stone ground coconut and almond butter, and to spice things up, a dash of maca powder, and you’ve got the perfect flavor blend of maltiness and spice - perfect for this time of year. Chai tea begins with a base of Camellia sinensis tea leaves which are fermented and oxidized, then combined with traditional spices such as cinnamon, cardamom, ginger, clove, and black pepper. The ingredients of chai tea combine to offer a myriad of health benefits including aiding in digestion, offering antioxidants, helping reduce nausea, offering support to the heart and cardiovascular system, helping support the body's inflammatory response, and supporting balanced blood sugar levels. Each of these spices has their own benefits, but when combined, they become even more powerful. Clove, cinnamon, and ginger all have been shown to reduce inflammation, and cinnamon can help support healthy blood pressure and help stabilize cholesterol and triglyceride levels. It's also a great spice for balancing blood sugar. Studies show that certain constituents in ginger root possess strong anti-inflammatory properties, and may even reduce symptoms of rheumatoid arthritis as effectively as steroids. Countries with low heart disease rates, such as Japan and China, may owe their good health statistic to tea - it contains antioxidants called polyphenols, which rid the body of cell-damaging free radicals. Tea is also commonly consumed after meals to aid in digestion, as it supports the pancreas in secreting digestive enzymes to digest fats and protein more efficiently. Maca has been consumed for thousands of years by indigenous people in Peru; it grew along the mountainsides at altitudes of 7,000 to 11,000 feet, making it the highest altitude growing crop in the world. Maca was consumed for its nutritional and medicinal benefits and is still a renowned superfood today. The root of the maca plant is what commercial maca powder comes from--the root is dried, packed and stored before being sent out to distribution centers. There are two main forms of maca we can buy: raw and gelatinized. Raw maca is vastly superior as it offers the full spectrum of benefits including minerals, vitamins, and enzymes. Gelatinized maca is processed using pressure and heat to remove starch, making it easier to digest; however, this process also removes many vital nutrients. Maca is an incredibly powerful superfood that is said to help increase energy, improve libido and strengthen bone density, all while offering a unique flavor (a combination of malt and butterscotch!). It also contains magnesium, iron, calcium, potassium, copper, manganese, sodium and is a rich source of vitamins C and B.
Maca is also said to aid in balancing hormones, nourishing the glandular system (especially the adrenals and thyroid), and treating PMS (say goodbye to mood swings!). Maca affects the pituitary gland, which regulates hormone production, and encourages the body to create its own hormones. In times of stress, or when weaning off hormonal birth control, maca can be a lifesaver in restoring hormonal balance. Maca is simple to incorporate into your daily diet. Because of its neutral flavor, it can be added into both sweet or savory recipes such as smoothies, soups, and even baked treats! 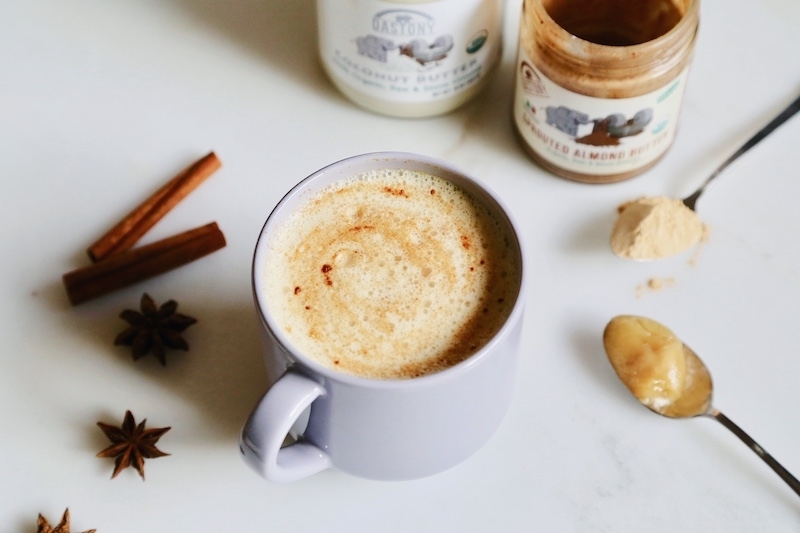 One of our favorite ways, of course, is in a warm, spicy chai latte. 1. Heat 12 oz water to a near boil. 2. Add instant chai mix to hot water in the pot. 3. Pour hot chai tea into a blender carafe, add remaining ingredients, and blend until creamy and frothy. Top with ground nutmeg. Enjoy!